Made by O'Keefe, Thelma in Australia, Oceania, 1956-1958. Johnny O’Keefe was Australia’s first rock ‘n’ roll star. Full of energy, confidence and ambition, he was a dynamic live performer with a raw voice and an exuberant stage presence that earned him the nickname ‘the wild one’. He hosted his own television shows and did much to encourage and promote other Australian rock performers, but his greatest legacy was as a performer and recording artist. Mens suit consisting of jacket and trousers, worn by Johnny O'Keefe. -1 Jacket made of red fabric with black and cream coloured 'leopard print' velvet trimming at collar, cuffs and pockets. The jacket has a shawl collar with the collar and lapels lined with leopard print velvet which extends on the inside of the jacket to the waist. The jacket fastens at the waist with a single black plastic button which is sewn to the jacket with red cotton. The jacket is long sleeved and the cuffs are trimmed with leopard print velvet. The jacket has a fake external left breast pocket and two fake external waist pockets on the left and right sides, all pockets are trimmed with leopard print velvet. There are no internal pockets. 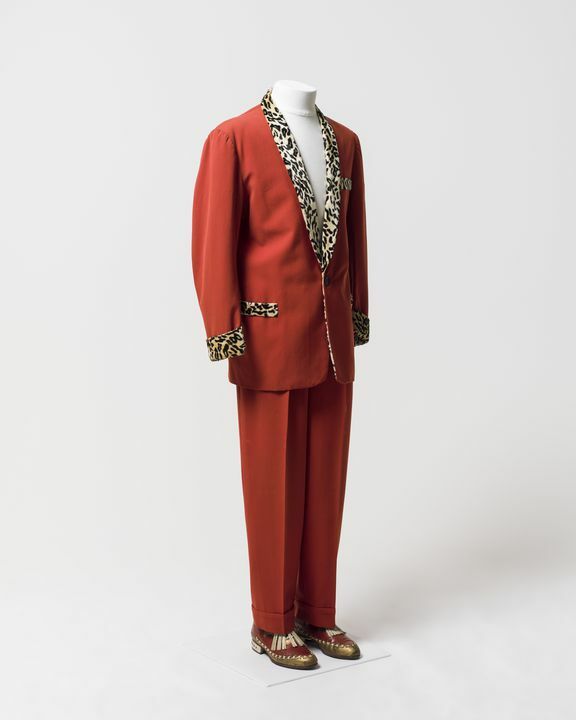 The inside of the jacket is lined with a red [silk] fabric and leopard print velvet lines the collar and lapel area extending to the waist. The shoulders are slightly padded. The jacket has several moth holes including two on the back of the right shoulder and two below the button. The lining has a hole at the neck and is torn at each armhole and has detatched from the velvet below the buttonhole. The velvet lining is worn around the neck and above the button. -2 Trousers made of red fabric, matching trousers to jacket (98/32/2-1). Trousers have 2 side pockets and a coin pocket at the waist on the right side. Inside of pockets are made of a cream cotton fabric. Trousers are pleated at the waist at the front and back and have 4 wide belt loops formed in the pleats and one thin belt loop and the centre back of the waist which has a safety pin attached. Trousers fasten at the centre front with a metal zipper, a metal hook and eye and an internal button on the left side of the waist which fastens to a buttonhole on a triangular extension of red fabric on the right side. The trousers are unlined except for the inside waistband which is lined with a band of cream ribbed silk and the zipper which is lined with black [silk] fabric. The trousers are hemmed to give the appearence of turned up cuffs at the hem of each leg. The fabric forming the inside of the right pocket has a handwritten inscription in black ink, 'O'Keefe's [sic]/3483'. There are white marks on the legs and repairs have been made to the crotch area. Probably made by John Portali, a tailor located in Leichhardt, Sydney. Johnny O'Keefe was Australia's first rock'n'roll star. John Michael O'Keefe was born in Sydney in 1935. In the mid-1950s O'Keefe began appearing at dances imitating American singer Johnny Ray. In 1956, inspired by the film 'Blackboard jungle' he formed a band, the Dee Jays. They promoted their own dances at suburban venues until O'Keefe's big break came when the promoter Lee Gordon booked him as a support act on Little Richard's eventful 1957 Australian tour. O'Keefe also got breaks performing supports for overseas touring artists like Bill Haley and Gene Vincent. In 1958 he released 'Wild one' (covered by Iggy Pop in 1985 as 'Real Wild Child') and became the first Australian rock performer to have a chart hit. Early in his career O'Keefe had a taste for flash clothes and overtly sexual stage antics. International tours were not as successful as he hoped, and in the 1960s he went into television as the host of '6 o'clock rock', 'The Johnny O'Keefe show' and 'Sing sing sing'. O'Keefe's career waned after 1964, although he enjoyed a revival in 1973. He died in 1978 aged 43. This is one of two costumes that Johnny O'Keefe donated to the Sydney Opera House's Dennis Wolanski Library and Archives of the Performing Arts. His donation was instigated by Barbara Firth, a family friend of the O'Keefes and member of the Ladies Committee of the Sydney Opera House Appeal Fund. She brought the two costumes to the Opera House on 14 November 1975. They were transferred to the Powerhouse Museum from the Sydney Opera House's in 1998.